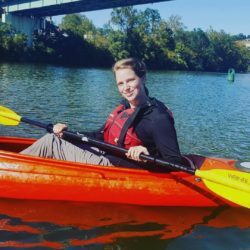 Along with years of experience in fiscal administration, project management, watershed restoration, and environmental education, Holly brings with her a fierce passion for the Earth and a love of working with the community. Prior to joining MRWC, Holly served as the Executive Director of Friends of Deckers Creek, where she oversaw the construction of large acid mine drainage treatment facilities, worked closely with the community, and led environmental education programming. Holly is a graduate of the Geography and Political Science departments of West Virginia University, and she has also worked previously with National Geographic Education and The Hunger Project United Kingdom. In her free time, she is an avid hiker, biker and boater. Kathleen earned degrees in History and Business Administration from Lewis and Clark College. She has volunteered in a number of capacities, including helping to found Muddy Creek Charter School in Corvallis where she served as the Board Secretary. 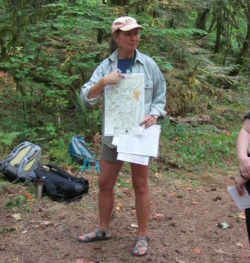 She is enthusiastic about engaging students in their place and helping them to become active stewards of the watershed. She uses her experience and knowledge as a 23-year watershed landowner and a decades-long avid gardener in her planting work, both with students and in conjunction with MRWC stream restoration projects.